Social media is so ingrained in our lives that it has become second nature to instantly document and share our daily happenings. Sometimes when we’re going through the motions at a rapid pace, we forget to say please and thank you. Read on to find out the eight social media etiquette rules to follow in 2018. You just had the best breakfast or cup of coffee and want to share your favorite neighborhood spot with your followers. Use the geotag (fancy phrase for adding your location) when you post your photo to Instagram or post a status on Facebook so they know where you were and, more importantly, how to get there. This also helps out businesses trying to spread the word about their food/drink/service and is an all-around good move to support other business owners. Always order all the kolaches, especially from @batchatx. 📸 @sujineatseverything. Tag #eateratx for regrams. Say you request to follow someone with a private account and they accept your request. They’ve said, “yes! you’ve been hand selected to follow along with my personal posts and musings.” If you also have a private account (which you won’t if you are correctly using Facebook and Instagram as a business 😀 ) and they, in turn, ask to follow you, you need to accept their request. It’s not fair to ask something from someone that you yourself aren’t willing to give. Hashtags started with a specific purpose – to be able to search for and find posts relevant to that topic. For example, you’re looking for tweets on social media, searching #socialmedia brings up not only the tweets tagged with that hashtag but also user accounts and top news about that subject. This is hashtags at their best. Avoid annoying all of your family and friends who you want to refer your services to their friends, not unfollow your posts. Take advantage of all the tools and capabilities only available on a business page, like address, hours of operation, and insights into post performance. Present yourself clearly as a professional brand and make it easier for potential clients to find you. Business Insider found that LinkedIn is regarded as the most trusted social media network by far compared to the other platforms out there. When you share appropriate, useful content on LinkedIn, your audience is more likely to take it seriously and to see you as a leader in your industry. Much like what conversation is appropriate for the Thanksgiving dinner table vs a night out with friends, social media etiquette applies here. 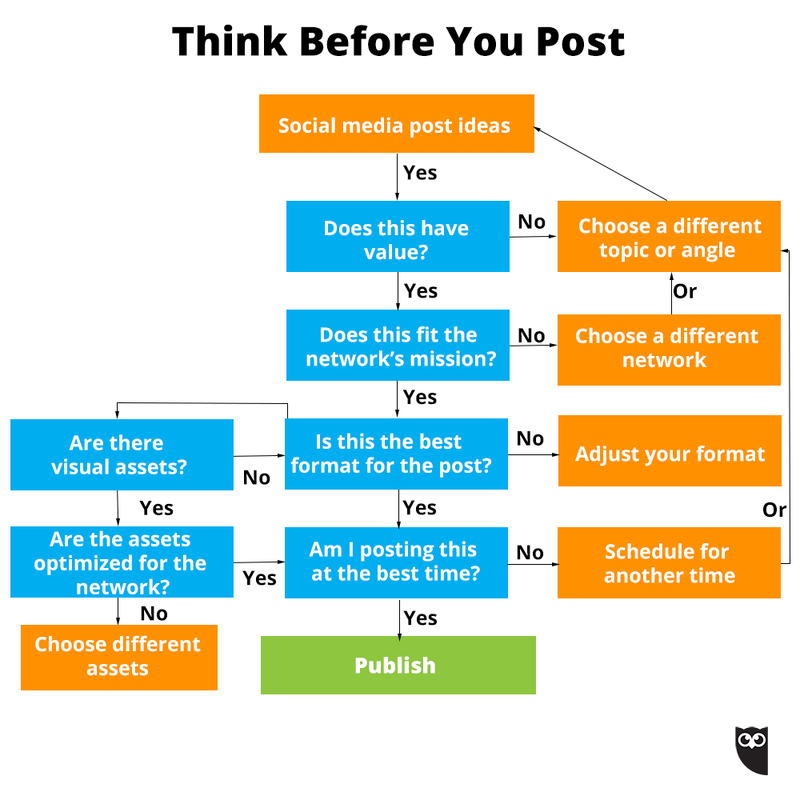 What you post matters as much as where you post it. This handy infographic from Hootsuite is a great reference to run through before posting until you feel comfortable with what works on each platform. This may seem like the most obvious, but it can often be the most difficult. If you go through the trouble of creating accounts, finding other accounts and people to follow, and promoting these pages, don’t let them collect dust. If keeping up with a posting schedule is the hardest part of social media etiquette for you, we can help. OutboundEngine is done for you automated marketing. See how marketing automation can help you stay top of mind with your audience.